Clint Conley is probably best known as the bassist for critically acclaimed (but massively underappreciated) band Mission Of Burma. Created from the ashes of Moving Parts with Roger Miller, the band came together in Boston with the addition of drummer Peter Prescott in early 1979. Six months later a mysterious fourth member- Martin Swope would be added. Swope hardly ever played with the band onstage-instead preferring to manipulate sounds and various effects from behind the soundboard. Since the rest of the band members all wrote songs-the results were truly hard to define. But bands such as Husker Du, The Stooges, and even Gang Of Four come to mind. But you really have to hear Mission Of Burma for yourself as they sound unlike any other band before-or since. Their recorded output was brief-two singles, and EP and one studio album was released during their existence. A posthumous live record and a few "basement" recordings trickled out after that. But when singer/guitarist Roger Miller began experiencing hearing problems the band called it quits in March of 1983. Roger Miller went on to form various outfits afterwards including No Man, The Binary System and Birdsongs Of The Mesozoic (with Martin Swope). Prescott formed Volcano Suns, Kustomized, and The Peer Group. Conley-well, Conley dropped out of sight. In 1986 Clint played and produced a record by Yo La Tengo and in 1996 he did a one time single with Miller called Wrong Pipe. But other than that, Clint did not emerge back on the music scene until very recently. Two factors seemed to lead the band down to a road to reunion in 2002. The first was the excellent chapter in Michael Azzerad's definitive book on the eighties/nineties alternative rock scene- "Our Band Could Be Your Life" on the band. (If you have not read this book-run do not walk to your local bookstore. It also features great write-ups on The Replacements and Minor Threat among others). For those who had not been there during their brief initial run, it gave a glimpse into what they were missing. For the band, perhaps it gave a new perspective that can only come with time passing. The message-Mission Of Burma is a great band that creates music that deserves to be heard. So in January 2002, the unexplainable happened-Mission Of Burma played their first reunion show-at Boston's Paradise Rock Club to ecstatic response. Swope has declined to participate in the reunion, he is holed up somewhere in Hawaii (probably underneath a volcano) so Bob Weston from Shellac-has ably filled in behind the boards to add the fourth layer to the group's live sound. 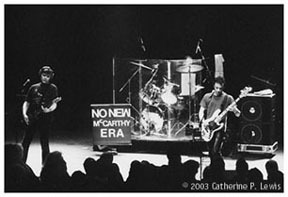 Live shows have continued across the US and abroad since then. There is even talk of a new studio record (more on that later). But make sure you see the band live if you get a chance-you will not be disappointed. During this dizzyingly productive round of musical activity, Clint also started his own band-Consonant. Although he had primarily played bass in Burma, he switched to guitar and lead vocals for this project, which formed in 2001. And even though he wrote many of Burma's best known songs like "That When I Reach For My Revolver" and "Academy Fight Song" in the past, he chose to collaborate with lyricist Holly Anderson for their self titled debut. Consonant features Matt Kadane on drums (Bedhead, The New Year), Chris Brokaw (Come and Codeine), and Winston Braman (Fuzzy, The Count Me Outs) on bass guitar. Clearly this is not a "rookie ball" line-up and the results prove that point. "That Boston Life" and "Blissful" stand out as great additions to an already impressive songwriting canon. Don't just take my word for it-look at the many artists those have covered Mission Of Burma songs in the past: Pegboy, Tommy Keene, Moby, R.E.M., Sugar, Catherine Wheel, Screaming Trees and Soul Asylum to name a few. Consonant may soon have the same honor put upon them. August 19th is the day that Consonant's second CD-"Love and Affliction" hits the streets. I recently spoke to Clint about these subjects and more via phone. Here's the story on what's happened and what's ahead for Clint Conley in life and in music. E.C. : How and when did you first get involved in music? Clint: I don’t know-it was back in the late 60’s and we were just picking up guitars and playing “Louie Louie” and “Gloria” and Hendrix. So I started on guitar and switched over to bass in high school. So that’s how I started-just playing along to songs on the radio. E.C. : Was Moving Parts the first band that you were involved in? Clint: The first band that I was doing original music in was Moving Parts. Yeah, I was in band through junior high school, high school and college and they were always cover bands. I was a rabid rock listener and a rabid rock fan. I grew outside of New York. I was going out in New York to check out music when I was in high school. I was into The (New York) Dolls and the glitter scene. Then punk started coming around and I always knew that I wanted to be in a band. I was tremendously excited about the music I was hearing. So around ’77-’78 I moved to Boston and joined Moving Parts; which was a friend-Erik Lindgren’s band. He was actually a friend of a friend. So that was actually my first original band. That lasted a few years-not sure how many. Roger (Miller) was in that band and that broke off to form Mission Of Burma. E.C. : Can you talk about what bands/artists you were influenced by growing up? Clint: Absolutely. I was in love with The Animals. I fell in love with The Beach Boys. The Beatles and The Stones too, of course. You know that was sort of the first wave of the psychedelic era. Hendrix, Cream and The Soft Machine. I don’t know if these are reflected in my songwriting now. I’m still very interested in compelling melodies. That probably comes from listening to The Kinks over all those years. There’s too many to even mention. E.C. : How did the formation of Mission Of Burma took place? Clint: Well, Roger and I were in the Moving Parts. He and I just seemed to have a very intense-we just seemed to share a real passion for the same kind of music. Which- not to over-simplify it was visceral, loud rock. Along with interesting, unusual, challenging, so-called “avant-garde” music; sort of out jazz. But we loved the sort of visceral simplicity of punk. So we hit it off and we split away from Moving Parts to form Mission Of Burma. We started Mission Of Burma and Roger had been writing music for years. So he carried on doing that but I’d never written many songs in my life-until Mission Of Burma. That was a new beginning for me. I was very excited to try my hand at songwriting. That’s how we started. E.C. : Can you describe the recording session for the first Mission Of Burma single? Clint: You know- we labored over that first single quite a bit. We had the very good fortune to be recording with Rick Harte who was a real stickler for quality. I mean a lot of the records that we listened to were clearly “one-offs”. A band went in, ripped something off really quick-sort of a devil may care and threw it down on tape. We worked a lot on that first single and Rick was very patient with us. As it turns out I think we over-worked it-“Academy Fight Song” and “Max Ernst”. I can’t remember-we were just really excited to be in a real recording studio. I mean we had recorded some things before that but that was our first 24-track recording. To be honest I can’t remember a whole lot about the session. We tried to over-compensate with the recording by working too hard at it I think. But it turned out pretty well. People like the single and it sounds accessible even today. E.C. : What Mission Of Burma record are you the most proud of being involved in? Clint: I think all of us are happy with the album “VS” as opposed to the E.P. “Signals Calls And Marches”. It came out after the EP and we knew that much more. We approached it in a different way. We wanted it to be stripped down and more “live” sounding. I think it is just a better record. I think all of us like the first one better. There’s so few to choose from; there was just one full length record and then a posthumous live one. There were some basement tapes that were released as well. But in terms of us going in to make a record-there was only a couple times that happened. E.C. : Is there any reason that the records that came out on Taang Records are not normally included on your discography listings? Clint: Those were also released after we broke up. They were tapes that were lying around and we authorized their release. We just never thought of them as real- you know up to the level of the other things. I mean there are some great songs on those other records. In my mind I never considered them on the same footing as the Ace Of Hearts records. I suppose I’m glad they’re out there now that a lot of our material has been re-released. But for awhile there the only thing out there were the Taang recordings and I felt kind of bad when that was the situation. They were like four track tapes done in the basement. I don’t think they really represent the band that well. They’re sort of more of a curiosity I think. E.C. : What Mission Of Burma song is the most enjoyable for you to play live? Clint: There are a lot of different answers to that. I like playing “Trem Two”-Roger’s song. I like playing Peter’s “Learn How.” I love playing “Learn How”; it just gets me so jacked up I think my head is going to explode. I like playing some of the songs I wrote too. For a long time I didn’t particularly like them but now I do. I like “Academy Fight Song” and “Dirt.” I think “Trem Two” and “Learn How” are my favorite songs to play. I enjoy myself more when I’m not singing in general. E.C. : What Mission Of Burma gig was the most memorable for you? Clint: The last show we did in Boston, the first time around was quite a good concert. On this latest round-since we started playing again I have to say they have all been really intensely fun-a very intense experience. The first shows we played in New York after our multi-year layoff particularly blew my mind. I had no idea that people were going to respond so positively. All of them have been very intense this last round. The 9:30 Club show (in D.C.) was also a great show. E.C. : The song “That’s When I Reach For My Revolver” seems to be the Mission Of Burma song that is covered by other artists the most. Which version do you like the best? Clint: Catherine Wheel, I thought their version was really good. E.C. : Will there be a new Mission Of Burma CD in the near future? Clint: Well, we do have a lot of new material. I tend to think that things are looking in that direction. There’s nothing definite yet. But people are writing new songs and we are trying to figure out what to do. We went into a studio recently and make some working tapes. They sound pretty good. But we don’t have a record company or anything like that. We had no idea when we opened the crypt again- a year and half later this is just a continual surprise to us. E.C. : In 2001, you came back out of “musical retirement” to form Consonant. What had you been doing before then? Clint: Just sort of re-tooling my life. I ended up going back to grad school and I started a career. Ended up getting married and having kids. Really all the things that add up to a nice life. There was really nothing during that time to lead me to believe that music would kick up again. But I was always immensely proud of the music Burma made. But I was just sort of in hibernation I guess. Then suddenly it just started kicking up again. I just started writing music again in sort of a torrent. Music came out and in 2001 that led to starting Consonant. Then Burma happened the next year. E.C. : There wasn’t really one main reason that you came back to music after an extended hiatus? Clint: There really wasn’t-it’s a strange thing. At some point I just kind of ran out of gas. In the early eighties, I just wanted to do other things. It just kicked in again. Who knows how long it will last? E.C. : Consonant has been a slight transition in that you are now “the frontman” and you switched from bass to guitar. Has that affected the songwriting process for you? Clint: Yeah. Not really because any music I had written for Burma I had written from guitar. I played it in my room late at night. I rarely played bass outside of the band. So anytime I wrote songs it was always from guitar. To me it’s rather-I would rather not be singing every single song. In fact the guys in my band I have begged them to come up with some songs and write some of the lyrics. But I guess they are saving them for their outside projects. So, yeah I guess I am the frontman and all that. It’s not that natural a role for me. But it’s been great- we’ve really been cranking them out. We have our second album coming out in August-in a couple weeks in fact. E.C. : All the members of Consonant (including you) are also involved in other projects as well. How does this situation affect your goals for the group? Clint: Well, it makes it hard. It makes it hard to schedule performances for one thing. People are always traveling and playing with other bands. I’m thrilled to be playing with these guys. I understand everyone has their own “thing.” Chris Brokaw is really working hard on his solo stuff. The others are involved with The New Year too. But it’s not like I want it to be a full time band. I’ve got a full time job and Burma so my plate is pretty full. It can get frustrating. I mean we have a record coming out and we’re trying to figure out when we can do gigs. I mean it may not happen until next year. We are playing out on the West Coast next month. Places I’d like to hit-D.C., Philly I’m not sure if we will get down there. But if we do we might try a different format-maybe as a trio. We’re doing the West Coast for a week in September and Matt Kadane is not going to be able to join us. He teaches at Harvard and can’t get away in September. So maybe we will go out with a different drummer-which is a shame. I love playing with these guys. But it’s hard waiting for all the stars to align. E.C. : Consonant’s second record-“Love and Affliction” comes out 8/19. The songs I’ve heard sound harder edged and more distorted in contrast to the cleaner guitar sound featured on the first release. Was that a conscious decision during the recording of the disc? Clint: There’s definitely some heavier moments on this one. It’s a more aggressive album. We went into wanting to make a harder hitting record. Yeah, it gets kind of brawny and bruised because of the guitar. I think that’s an accurate interpretation. E.C. : What songs on the new record are you the most happy with? Clint: It’s hard to single one out. There are a lot of different textures on the record, a lot of different guitar tones and feelings. I like that it’s varied the most. It’s not one sound. Plus I play my first guitar solo on a song-I’m excited about that! Now I’m a real rocking guitar slinger. E.C. : What bands/artists that are active now have you been impressed with? Clint: I haven’t really seen anybody lately that I’ve been wild about. The only band that I can think of offhand is Deerhoof. They’re really quite good. E.C. : Are they’re any bands/artists that you wish you could collaborate/write a song together? Clint: That’s an interesting question. I mean I’ve never really seriously considered that. My songwriting process is usually pretty solitary. I can’t really think of anybody at the moment. E.C. : What are your immediate plans for Consonant in the future? Clint: Well, I think we are going to try and get out and play. But I think its going to be like to Chinese water torture to say-really. We’ll do a couple of trips. Go back into hibernation-do a couple of trips a month later. Basically we are a band that can only play on weekends. We’ll try and get out when we can- but it will be a very slow process. E.C. : Thank you for your time and good luck with your upcoming projects.